Striving to be my authentic self! Memoirs are my favorite genre to read. When I was asked if I wanted to review My Glory Was I Had Such Friends I said, “Yes,” without even reading what the memoir was about. As long as it’s a memoir I’m down for reading it. When I got my ARC copy in the mail the hummingbirds on the cover stood out to me in their different colors. Now that I finished reading Amy’s story I know the symbolism behind the hummingbirds. Amy’s memoir takes you on a front seat tour of what life is like living with a heart transplant and realizing it’s time for needing a new one. Her descriptions of procedures are not for the squeamish, but are important to fully understand what her life and many other’s lives are like who have a donor’s heart. Amy is candid, funny, grumpy and strong-willed. She will make you laugh and cry throughout this gem of a book. This book is not only about Amy, but about her assortment of close girlfriends who rally around her to help her out while she is staying in the hospital waiting for a second heart transplant. The one she’s had since age 25 is waving its white flag now that she’s 50. That feat in and of its self is a miracle. Each of Amy’s close girlfriends are depicted in all their uniqueness, quirks and all. One of her best friends puts together a spreadsheet of whose coming to stay with Amy when and each time someone stays they email the circle of friends to update them on Amy. 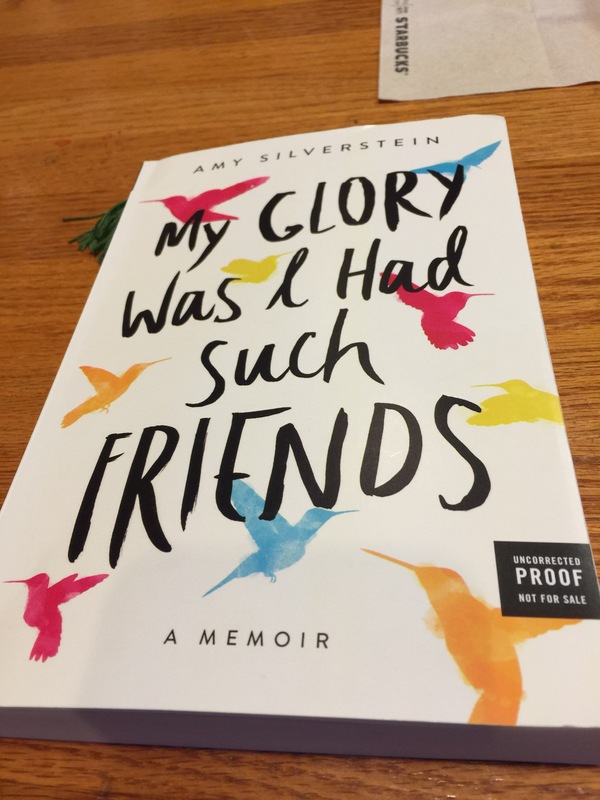 I received an ARC copy of My Glory Was I Had Such Friends courtesy of TLC Book Tours to review and give my honest assessment. This book shows how friendships change through the years, but close friends are vital to our lives. It’s sad to me that superficial friends seem to be the norm. I don’t know how many girlfriends in my life would do what Amy’s friends did for a weeks and sometimes weeks at a time. These women had their own families and obligations, but they made Amy their priority even when it wasn’t easy or pretty. May we all have the depth of friendship Amy is blessed with. Thank you for blessing me with your memoir. To get your copy click here to purchase from HarperCollins.